Since NASA’s Dawn spacecraft detected localized organic-rich material on Ceres, Southwest Research Institute (SwRI) has been digging into the data to explore different scenarios for its origin. After considering the viability of comet or asteroid delivery, the preponderance of evidence suggests the organics are most likely native to Ceres. Ceres is believed to have originated about 4.5 billion years ago at the dawn of our solar system. Studying its organics can help explain the origin, evolution, and distribution of organic species across the solar system. The very location of Ceres at the boundary between the inner and outer solar system and its intriguing composition characterized by clays, sodium- and ammonium-carbonates, suggest a very complex chemical evolution. The role of organics in this evolution is not fully understood, but has important astrobiological implications. Scientists explored a range of impact parameters, such as impactor sizes and velocities, using iSALE shock physics code simulations. These models indicated that comet-like projectiles with relatively high impact velocities would lose almost all of their organics due to shock compression. Impacting asteroids, with lower incident velocities, can retain between 20 and 30 percent of their pre-impact organic material during delivery, especially for small impactors at oblique impact angles. However, the localized spatial distribution of organics on Ceres seems difficult to reconcile with delivery from small main belt asteroids. 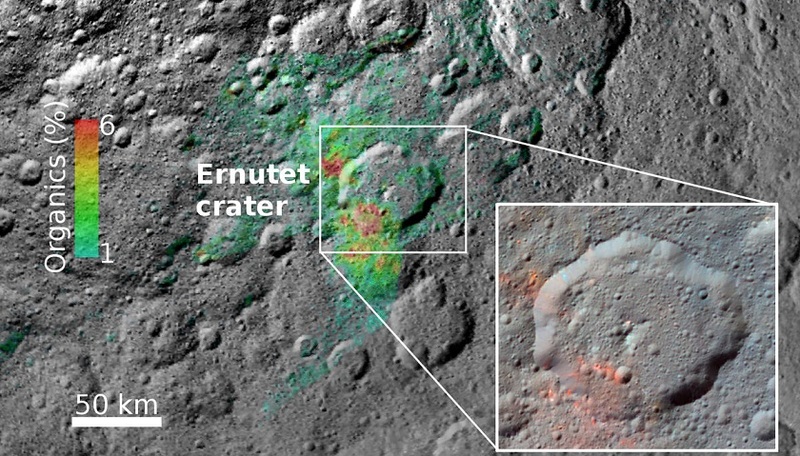 “These findings indicate that the organics are likely to be native to Ceres,” Marchi said. Dawn’s mission to Ceres and Vesta, the two most massive bodies in the main asteroid belt, is managed by the Jet Propulsion Laboratory for NASA’s Science Mission Directorate in Washington, D.C. Dawn is a project of the directorate’s Discovery Program, managed by NASA’s Marshall Space Flight Center in Huntsville, Alabama. UCLA is responsible for overall Dawn mission science.